Award-winning music producer, Tedd Josiah, celebrates his late wife´s birthday in heartwarming message on his social media pages. The legendary music producer has been raising his daughter, Jayjay, single-handedly and affirms that the little girl will grow to one day appreciate her lovely late mom. Jayjay was left in the care of her father after mother, Regina Katar succumbed to internal bleeding, with very few platelets in her blood. Having just been a 3-month old mother to Jayjay, Regina passed on with post-natal wounds still fresh. Tedd´s late wife, Reginah Katar and daughter Jayjay According to Ted, what took away his wife´s life is a very rare condition especially among African women. His wife´s platelets were so diluted, therefore, a significantly reduced count that could not hold her up any longer. However, Regina had had internal bleeding earlier on, though had not been detected neither treated; news that Tedd and family received after her passing on. Happy Happy Birthday to the adorable woman as she dances with the Angles! 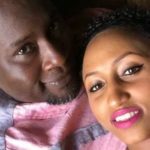 The post ¨More than a woman, more than a Queen…¨ Tedd Josiah celebrates his late wife´s birthday in her absence appeared first on Ghafla! Kenya.